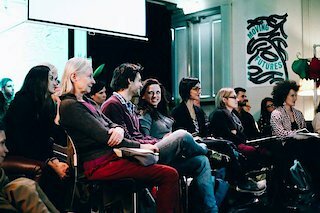 Moving Futures is a network initiated and founded in 2013 by five Dutch dance houses: Dansmakers Amsterdam, Dansateliers, DansBrabant, Random Collision and Generale Oost. The network supports a new generation of choreographers and promotes visibility of their work. By creating this widespread national network and at the same time joining forces on a local level with theatre venues and partners, the dance houses have created a variety of possibilities to give exposure to the work of emerging choreographers on an international scale. Moving Futures Festival is the traveling festival of the network. After a successful first edition in 2014, the second edition of the festival toured around 11 cities in Holland and Germany in 2015-2016. With the festival Moving Futures facilitates a lively dialogue about dance today and supports the exchange of expertise, ideas, contacts and inspiration. The Open Studio will offer a variety of works by a selection of choreographers who are connected to the individual dance houses.